After our wonderful temperatures and flowers and blooming trees of Spring, Mother Nature decided to show us that Winter wasn't about to leave yet. 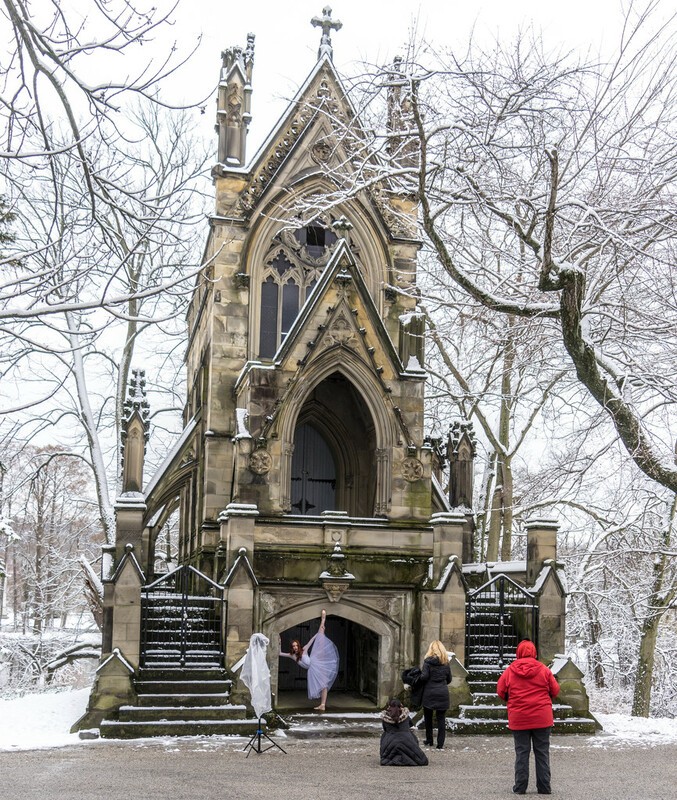 I went down to get some of my favorite monuments in the snow and happened upon a photo shoot of a ballet dancer at the Dexter Mausoleum. You never know what you will find. That's pretty wildly cool. Poor her! COLD!!! Beautiful backdrop to the ballerina ! What a great thing to happen upon! Brrrrrr for the ballerina but great for you! Fun shot! Lovely winter capture and it does look pretty much like it looks here. Wonderful timing on your part. I was very surprised when I first looked at the thumbnail. Great find! Love the building! Gorgeous. We went to Spring Grove but apparently missed this!